It’s not every day that you hear about someone diagnosed with terminal cancer running a marathon. But David Eitrheim, M.D., a longtime physician at Mayo Clinic Health System – Red Cedar, in Menomonie, Wisconsin, did just that last November, completing the Rails to Trails marathon, held along the Elroy-Sparta State Trail. This month, he’s taking thing a bit further by setting his sights on the Jan. 24 Coldwater Rumble – a 100-mile ultramarathon in Arizona’s Estrella Mountain Region Park. In July 2013, Dr. Eitrheim, was diagnosed with squamous cell carcinoma of the tongue. As the Eau Claire Leader-Telegram tells it, tests at Mayo Clinic’s Rochester campus revealed the cancer had spread to two of his lymph nodes. The following months were a grueling series of surgery, chemotherapy, radiation, and a roller coaster ride of hope. The cancer seemed to have disappeared at one point. Last May, Dr. Eitrheim learned that the cancer had returned and spread to the lymph nodes on his neck and chest. He was told he had six to nine months to live. Dr. Eitrheim had been an avid runner and marathoner, with a lifetime entry to Grandma’s Marathon in Duluth, but this diagnosis prompted him to retire his annual registration and give his running shoes to a friend. 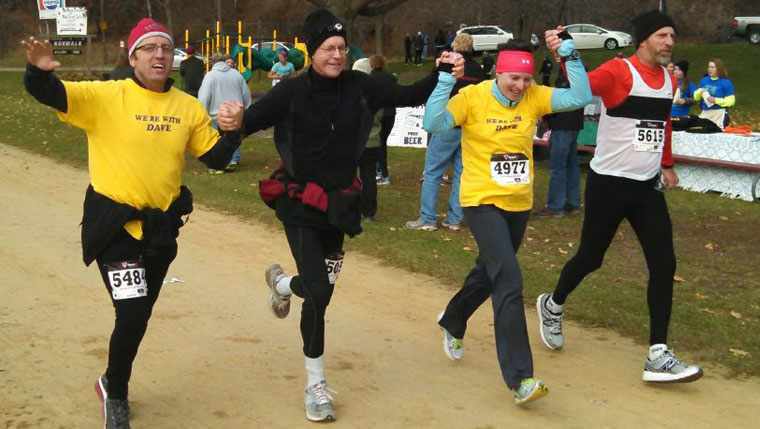 A former colleague, James Deming, M.D., became his palliative care physician and gave his friend and patient a reason to run again. Dr. Deming asked, “What would give you a really good day?” Being able to run was Dr. Eitrheim’s reply. And that was that. Two weeks later, Dr. Eitrheim had not only completed a 13-mile training run but had also found it within himself, despite still undergoing chemotherapy treatment, to sign up for what would be his 90th marathon. On Nov. 2, he successfully completed that marathon, crossing the finish line hand-in-hand with running friends. Buoyed by that success, Dr. Eitrheim set his sights on an ultramarathon. Cheer Dr. Eitrheim on his inspirational journey by sharing your comments below and also share this story via the social media tools above.